Public Service Minister Elias Kapavore launches the first Precinct event in Kokopo. 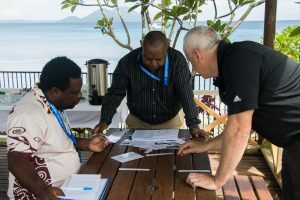 The Papua New Guinea Institute of Public Administration (PNGIPA) is increasing its regional training programs, with the aim to develop provincial and district leaders. PNGIPA, a core partner of the Pacific Leadership and Governance Precinct, launched its Project Management course in Kokopo, East New Britain Province last week. The Project Management course was attended by more than 20 participants and marked a significant landmark for PNGIPA. The Precinct is supporting PNGIPA’s training delivery which includes increased opportunities for vocational education in subnational areas and improvements to regional training centres. 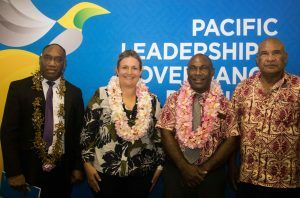 The course was launched by Public Service Minister Elias Kapavore, Department of Personnel Management Secretary Mr John Kali CMG OBE, Provincial Administrator Mr Wilson Matava and Ms Penny Dennis, First Secretary at the Australian High Commission. Project Management students and facilitators work through a course exercise. Minister Kapavore told the participants the Precinct partnership was supporting many positive changes at PNGIPA. 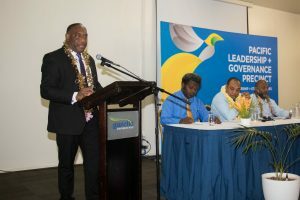 “We want to take the institution to the next level as the premier School of Government in the Pacific Region and we are committed to doing this with the support from our partners,” he said. “We are focused on improving the quality of courses delivered in the country and we will be extending these courses to the New Guinea Islands region, Madang and parts of the Highlands. Ms Dennis said the Australian Government was pleased to support the Government of Papua New Guinea’s focus on transparent and accountable subnational leadership. Left to right: Elias Kapavore, Minister for Public Service; Penny Dennis, First Secretary at the Australian High Commission; Angori Wewerang, PNGIPA Director; John Kali, DPM Secretary. The Precinct supports the decentralisation process through the development of public sector leaders. It is creating a generation of leaders who can improve service delivery, economic opportunities and community development throughout Papua New Guinea. The Precinct is a partnership between the Governments of Papua New Guinea and Australia to support the development of ethical, capable public sector leaders throughout Papua New Guinea.